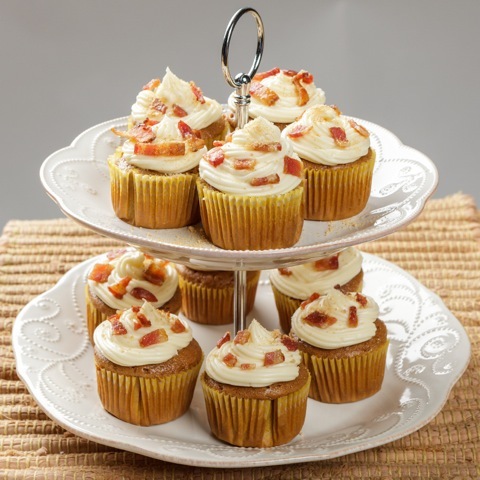 These cupcakes bring together the amazing blend of flavors that results from maple syrup, Carolina Pride bacon and spice cake mix. Bake cupcakes according to package instructions. Set aside. Make candied bacon. Preheat oven to 350°F. Mix brown sugar and cayenne pepper in a bowl; set aside. Place a wire cooling rack on a baking sheet and brush rack with vegetable oil. Place bacon on wire rack and cover generously with sugar/pepper mixture. Bake until bacon is crisp and sugar is melted and bubbly, 15-20 minutes. Remove from oven and allow to cool. 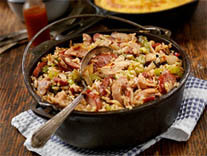 Chop into small pieces and measure out about 1 cup of chopped bacon. Make frosting. In bowl of mixer with paddle attachment, beat together butter and cream cheese until smooth. Add maple syrup, salt and vanilla. Gradually incorporate sugar. Continue mixing until everything is combined and frosting is smooth. Frost cupcakes and top with candied bacon.